The demolition order against our peace project was still valid. 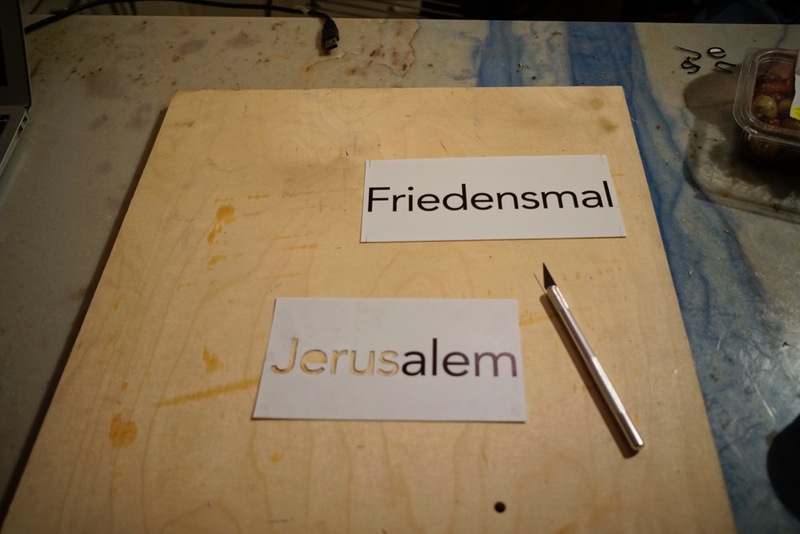 I started designing the signpost for the Jerusalem Peace Memorial (German: Jerusalem Friedensmal) which is the parent project of the Garden of Freedom. I cut a piece from a travertine plate to produce the sign. This material was also used for the “dance floor”. I printed letters onto foil and used a knife to cut out the letters. 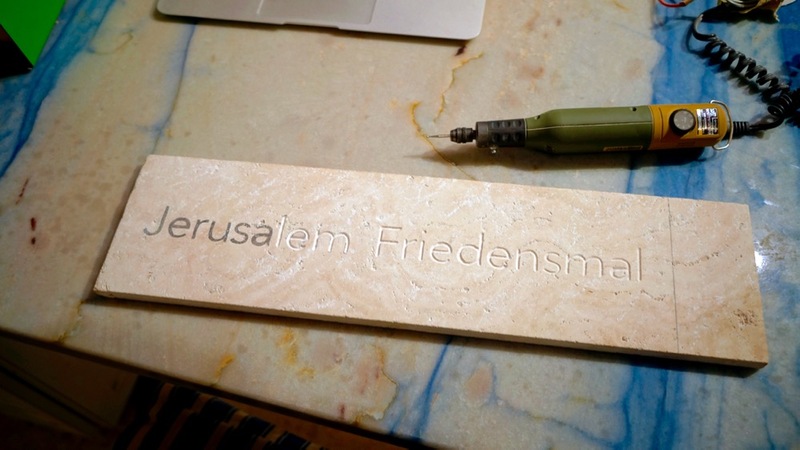 Using the blueprints, I painted the letters onto the travertine slab using a pencil. I then used the tool that can be seen in the picture to mill the letters into the material. I subsequently gilded the letters and put the sign and the post together. A small information panel, which I produced beforehand, was affixed on the post. This is what the square at the Border Stone looks like in reality. All that’s left to do is the embellishment of both benches. 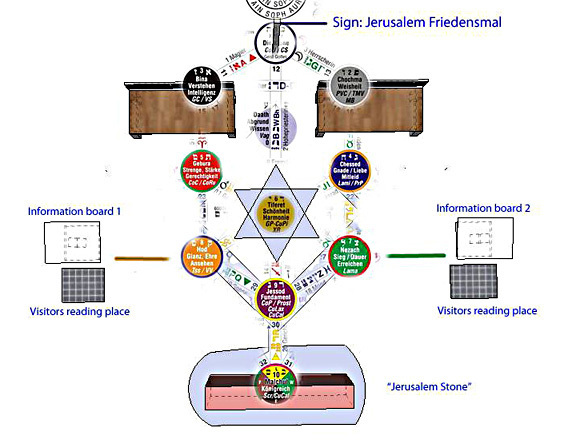 The two pre-existing information panels combine with the third and form a triangle. 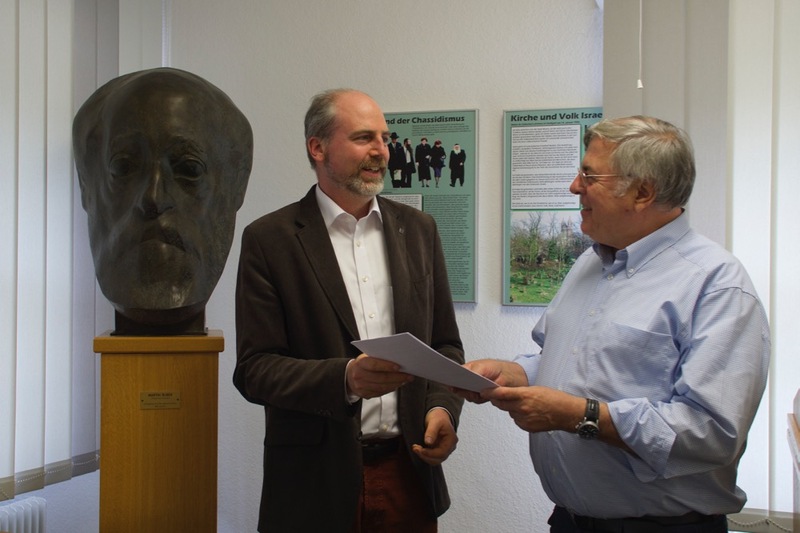 Mr Karl Netzer hands me Ms Buber Agassi’s declaration of entry to my association as I give a speech at the Martin Buber Haus. 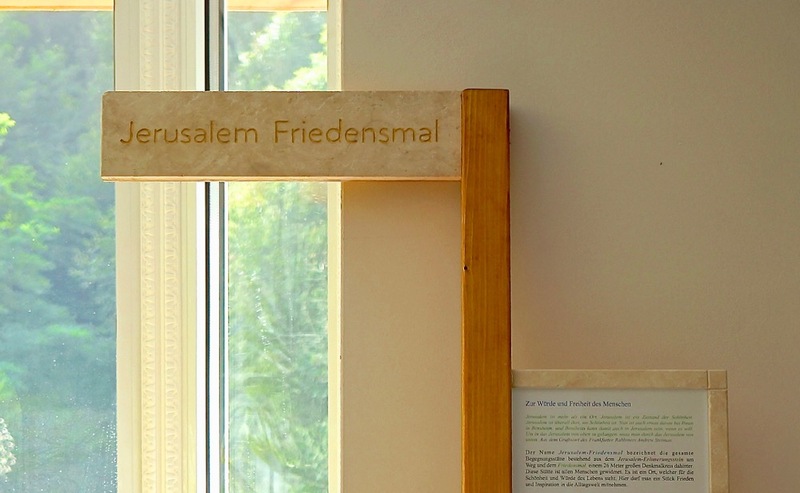 This is meant as a gesture of support during the conflict surrounding this peace project. 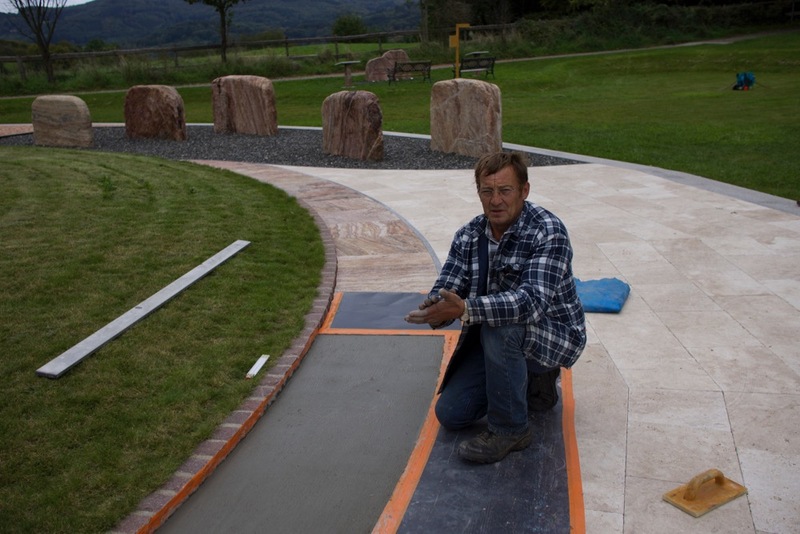 The quartz slabs were laid only at the beginning of the arch above the "tree top" left and right. 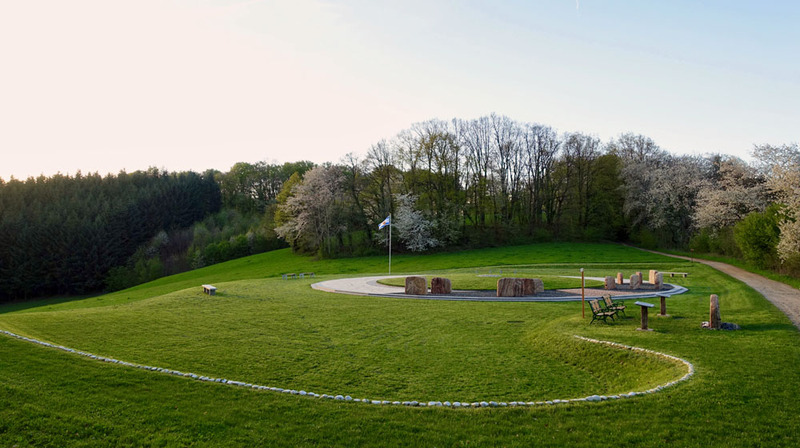 In the middle a long bowed section of exactly 26 meters was left open. This section was filled with concrete. 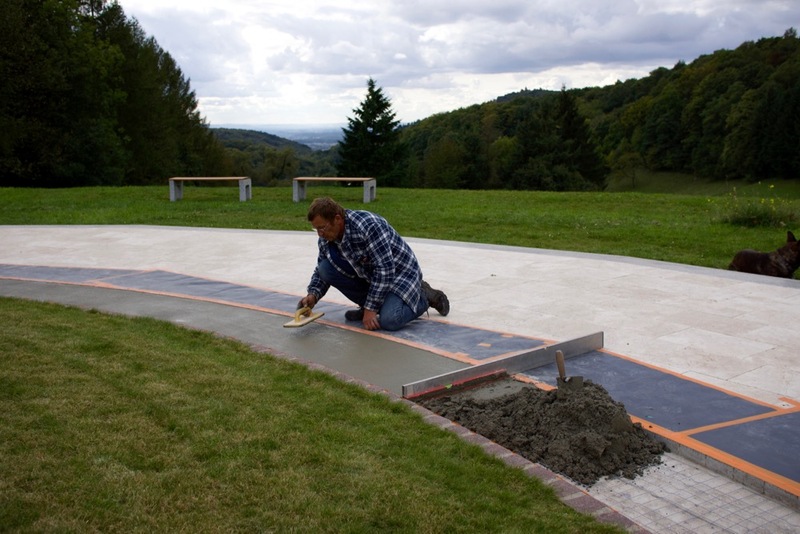 Ferdl now places wire mats on this initial layer of concrete, to be turned into a concrete surface, as smooth as possible, which is flush with the "dance floor". The concrete surface itself should slant slightly to discharge rain water. The concrete has been applied and smoothened by Ferdl. The surface is ready and should now dry. 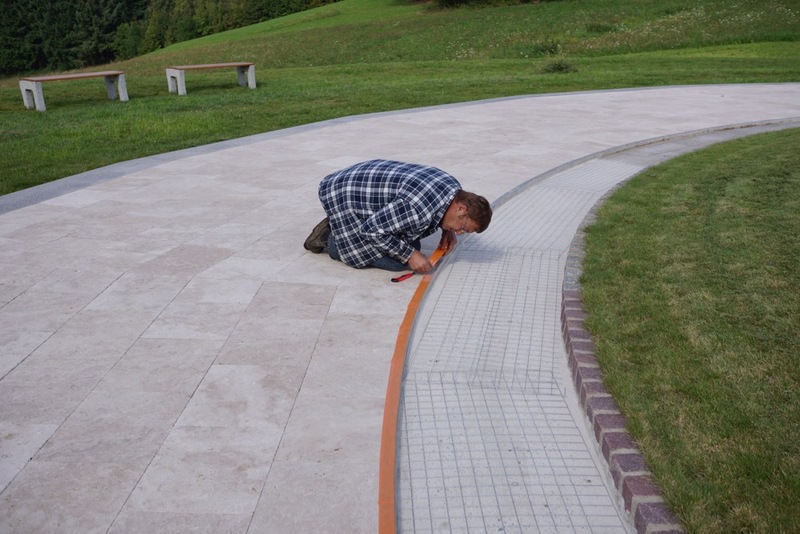 Later, a fine-glass-mosaic, 26-metre-long rainbow with 7 rings shall be placed on it. I have added new Douglas fir laths and paint the bench in my favorite shade of green. 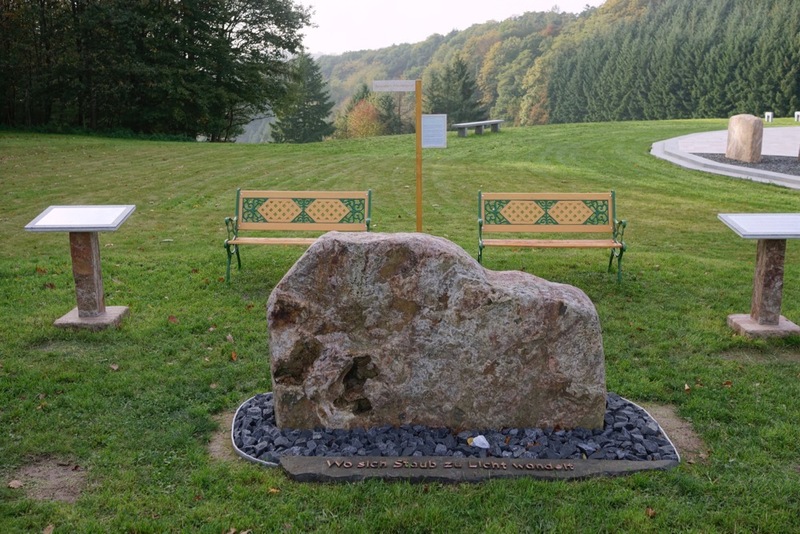 This is what the area surrounding the Border Stone looks like with the renovated benches. This is the symbol for the entire Garden of Freedom. An image of July 5, 2013, before the drainage measures. 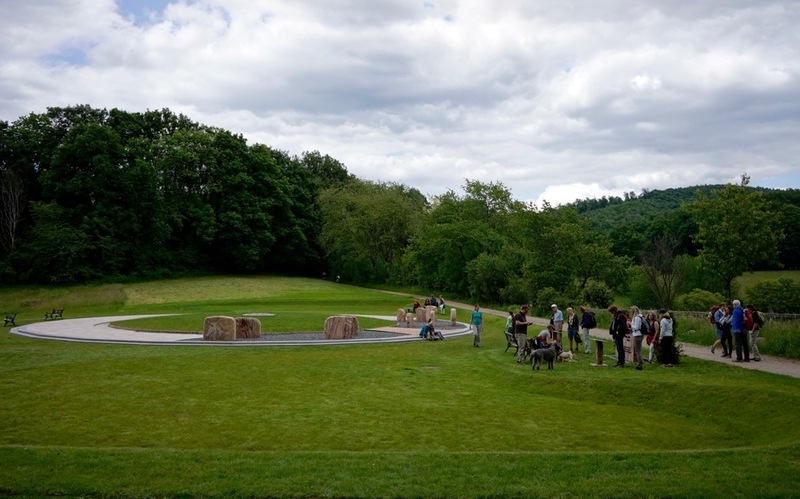 This is what the monument site looks like after the drainage measure with the angel‘s wings. A view of the situation today. 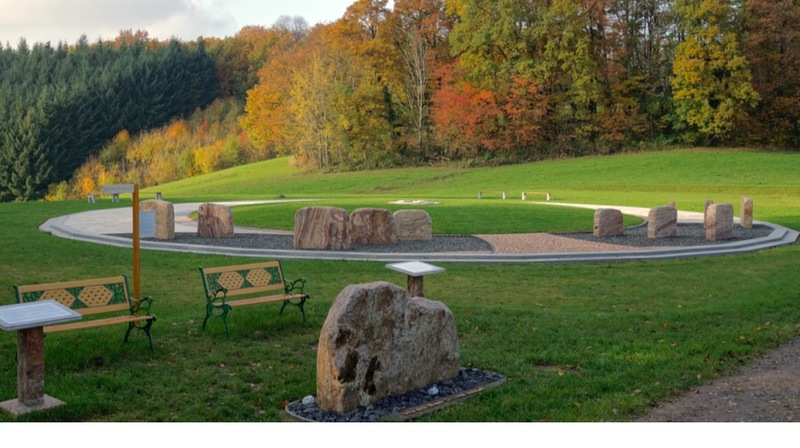 Pebbles were placed at the edges to accentuate the shape of the angel’s wings. An agreement has been reached with the authority. 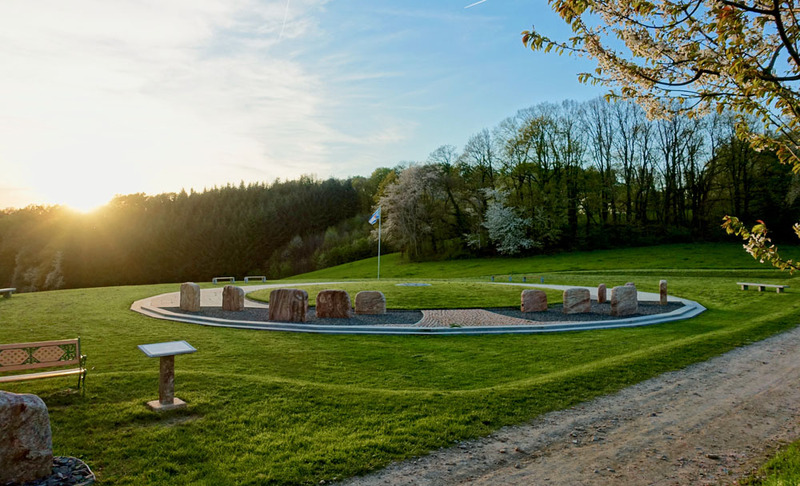 The Garden of Freedom may be preserved with the Border Stone, the benches and information panels in this form. 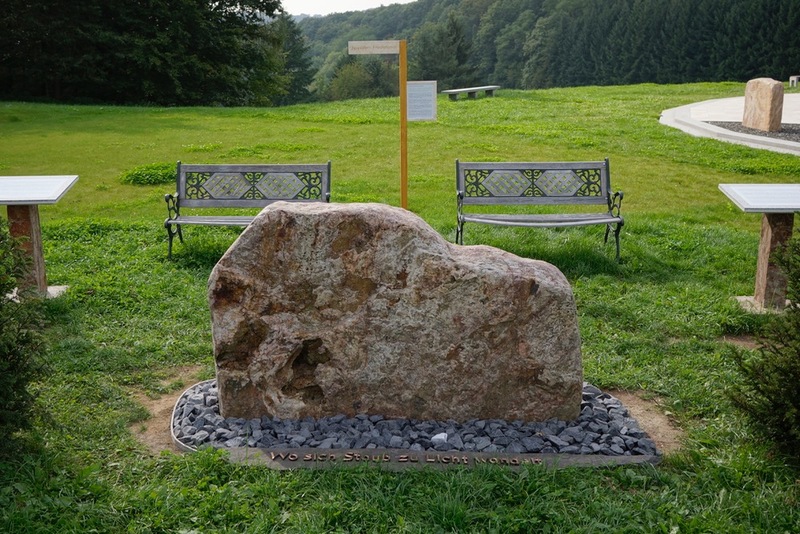 Many readers who have read all the way up to here may notice that the entire saga surrounding the Border Stone in the Garden of Freedom – with the fence, the drainage measures and angel’s wings, the conflict with the authority and the environment, and its solution – is a parable, written by life itself.